Tile floor restored and looking great! 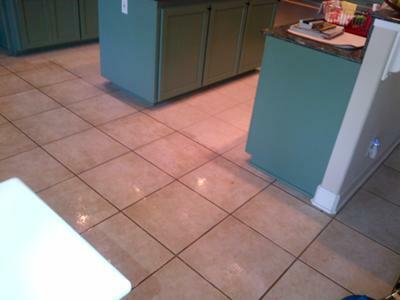 Mark and Sierra Tile and Stone Care have our highest recommendation if you are in need of tile floor reconditioning. The results he achieved are just amazing, and the entire process from initial contact to final walkthrough and payment was a pleasure. We hope to have him back for maintenance and for anything else that might come up. We bought a house needing lots of "deferred maintenance" including about 800 feet of tile flooring. I took a toothbrush and scrubbed a small part of the grout to get an idea of how bad the problem was. Soon it was apparent that professional help was called for, so I Googled the matter and found Mark and Sierra Tile and Stone care. Mark took the information over the phone, gave an understandable and reasonable idea of how much each option would cost, and made an appointment for a site visit. At the site visit, Mark assessed the situation, took measurements, reviewed options, and followed up with a written formal proposal for tile cleaning and grout sealing with coloring. The job started and completed on time without issue. The transformation was amazing. The picture just starts to show the results that were achieved. Furthermore, Mark cleaned up the grout so well that he decided coloring wasn't necessary and went with clear sealant, saving us money. All in all, a great job, and again Mark and Sierra Tile and Stone Care have our absolute highest recommendation. Comments for Tile floor restored and looking great! Thank you so much for the awesome review! I actually just noticed two days ago that the review had been submitted by you (quite a long time ago I might add). Evidently, there was a glitch with my website and I was never notified when you originally submitted it (along with a couple others). Then it wouldn't allow me to post it until today. I think I have it sorted out finally. So again a very belated thank you.